When 2016-17 football season starts In Top 5 European Leagues ? All top Football league’s has concluded around europe and we move to a competitive international summer where Copa America and European Championship 2016 will be taking place in June and early july. Copa America will be played from 3rd June – 23 June 2016 while Euro 2016 will be played through 10th June to 09th July 2016. While the pre-season friendlies will begin in mid July. We take a look at all the top european league’s next season start dates and when their official fixtures will be announced. Usually of the top 5 top european league (England, Spain, Germany, Italy and France) Premier League start the earliest and next season Premier League will get underway on the weekend of 13-14 August 2016 (Confirmed). 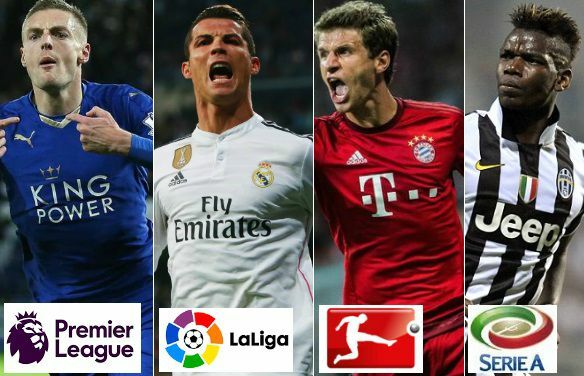 While Spanish La Liga and Italian Serie A will begin on the weekend of 20-21 August 2016. La Liga also have two weeks Christmas and new years break. German FA has also announced the 2016-17 season dates in Germany. The fixtures will be announced in early July 2016. Since Germany has only 18 teams in the top division there are only 34 matchdays which means German Bundesliga can afford late start to the season and more breaks. Unlike the other top european leagues, In France fixtures are announced as early as end of May. This year French FA Will officially unveil the full fixture list for next season on Friday, 27 May 2016.